Jonathan and Nathalie Montague, Beaulieu Palace house. National Motor Museum. 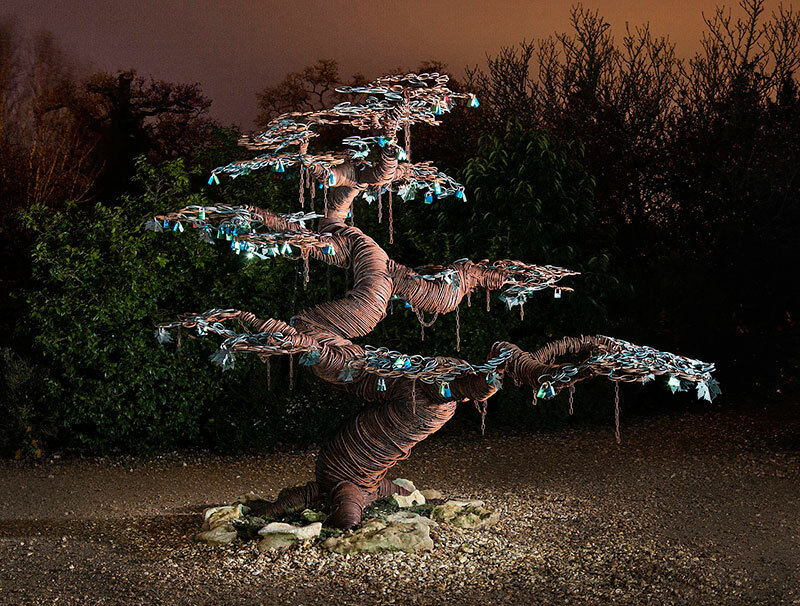 The tree was fabricated in SHS steel, 8mmø steel bar, waterjet cut verdigris copper leaves, 6mm copper swirls standing 9ft tall in the victorian gardens at Beaulieu Palace in Brockenhurst UK. Jonathon Montague and Nathalie Doust, commissioned Creative Fabrications to design, create and install a permanent sculpture in the form of a giant bonsai Love lock tree to celebrate the couple meeting in Japan, for their wedding on 4 October 2014. 150 guests were invited to help the tree flourish by adding their own copper leaves attached to engraved padlocks to the tree after the wedding ceremony. The guests then threw the padlock keys into the near by lake at Beaulieu’s national motor museum to symbolise an unbreakable bond of love. The bonsai tree is a permanent sculpture and guests to Beaulieu are invited to add lovelocks to the tree upon their visit. More info on the love Lock tree can be found here.